We are delighted to be able to bring back Deep Drill and launch it at Saltex 2009. Pheonix - our nickname for the Deep Drill - has undergone a complete overhaul since acquiring it from C&P Soilcare in March 2009. Any groundsman will tell you of the constant battle and challenges they they face when having to deal with areas of a football pitch that may suffer with over use, poor air circulation or lower light levels due to the presence of the supporters stands. Ipswich Town Football Club are no exception but are burdened with a further complication in the corner of the ground where the south and west stands meet because it is the point where the players run onto the pitch and where the ground staff gain access to the pitch to carry out maintenance. We are delighted that we are now able to offer a deep drill service to compliment our range of rootzone turf de-compaction treatments. For me it represents a very nostalgic and proud moment because I was originally responsible for importing the original machine in September 1992. 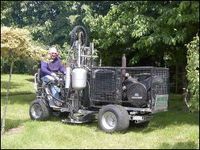 Sadly, in the intervening years and while concentrating on building up Terrain Aeration, I did not have dealings with the deep drill machine; until very recently when we rescued her from a dank barn, in a battered and broken state, purchased her and began the task of re-building - from that day on she became 'Phoenix'.